Imagine 53 hours without sleeping. - with a mask to protect you from jellyfish that keeps getting bounced into your face and mouth. Imagine "pushing Cuba away, and reaching for Florida" with every stroke. Imagine the thoughts rushing through your mind when you know you are going to do something you waited 35 years for. With all this, we have to know in our hearts that nothing is impossible. You just have to "find a way." "Find a way. Just find a way." Diana Nyad, equipped with her specially designed jellyfish suit for her 110-mile swim from Havana, Cuba to Key West, Florida has made it to Smathers Beach in Key West, FL. 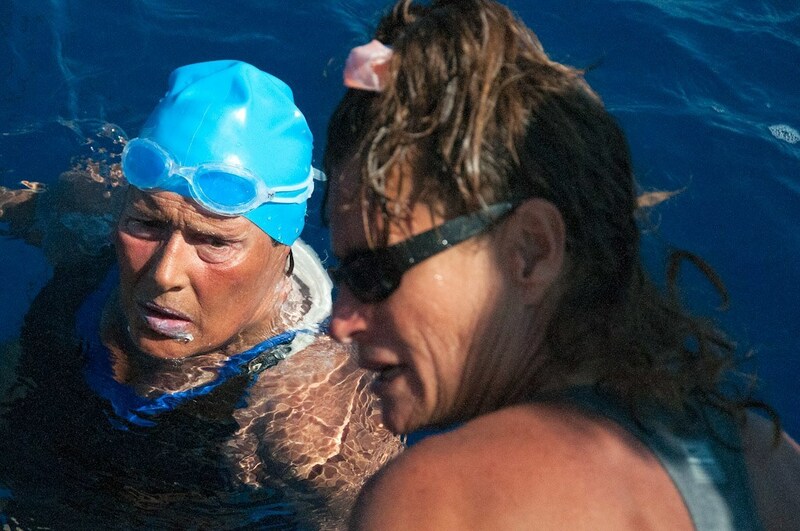 This was her fifth attempt to complete the swim over the last 35 years. In the past, she has faced problems such as allergies and deadly jellyfish, as well as turbulent squalls and unpredictable weather. 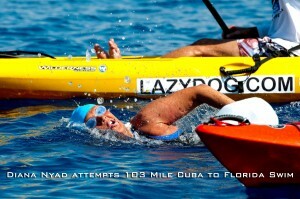 During this attempt, she has encountered all of those threats, but has managed to complete the daunting 110-mile swim. Her first attempt was in 1978 when she was 29 years old. “PEOPLE WHO GO TO MT. EVEREST…SOMETIMES IT TAKES THEM 20 YEARS TO MAKE IT, AFTER MOUNTING EXPEDITION AFTER EXPEDITION. NO ONE HAS EVER DONE THIS BEFORE WITHOUT A SHARK CAGE, SWUM ACROSS THE FLORIDA STRAITS FROM CUBA TO FLORIDA, THOUGH PEOPLE HAVE TRIED SINCE THE 1950S. IT’S MORE THAN 103MILES IN OPEN WATER, A NAVIGATIONAL NIGHTMARE, WITH VARIABLE WINDS AND GULF STREAM CURRENTS, NOT TO MENTION SWARMS OF JELLYFISH AT NIGHT NOW MORE THAN EVER BEFORE. IT’S NOT ENOUGH TO BE A STRONG SWIMMER; YOU NEED A LOT OF LUCK, TOO. SO HERE I AM FOR MY FIFTH—AND LAST—TIME. IT’S A FINE LINE BETWEEN HAVING THE GRACE TO LET GO OF SOMETHING YOU DON’T HAVE CONTROL OVER AND JUST CAN’T BEAT….AND I COULD BE IN THAT PLACE …EXCEPT I HAD TO ASK MYSELF, IS THERE A WAY? SO I’VE MADE PREPARATIONS TO TRY TO PROTECT MYSELF FULLY FROM THE BOX JELLYFISH. I HAVE THE BEST SUPPORT TEAM EVER AND HAVE TRAINED CONSISTENTLY AND RIGOROUSLY FOR FOUR YEARS NOW. I FEEL STRONGER AND MORE PREPARED THAN I’VE EVER BEEN. IT’S A FINE LINE BETWEEN HAVING THE GRACE TO SEE THINGS ARE BIGGER THAN YOU ARE AND THERE’S ANOTHER FINE LINE, AN EDGE, WHERE YOU DON’T WANT TO EVER GIVE UP. Support boats surrounded her with medical experts as well as shark and jelly fish experts keeping an eye on her and keeping her safe. Throughout Nyad’s swim, she had several feedings consisting of a thin smoothie-type mixture containing bananas, peanut butter, honey and other ingredients that tastes like tea. She also ate peanut butter and honey sandwiches as well as water. Her first feeding was as soon as an hour and a half into the swim. During her swim, she ran into some trouble because of storms in the area while she was swimming. There was a lightening storm within 4 miles of her location around 10:22pm on Saturday night. There was one other time during her swim where she had to deal with violent weather. During her medical examination around 7:15 Sunday morning, the Doctors reported, “her pulse is strong and her lungs are clear. Diana’s shoulders are sore, but not hurting.” The Doctors were very optimistic and said she was looking very good. Diana’s Website, www.diananyad.com, reported Diana had been vomiting every time she drank throughout the night, but once the jellyfish mask was removed she ate some pasta and was able to keep it down. The doctors did not administer any nausea medication. The only medication Diana has taken is Tylenol. Around 10:00 AM on Sunday Morning 25 hours into her swim, Diana stopped to make sure everyone was still there. She asked the crew if everyone was still there, and when she saw everyone assembled, she stopped and said, “Today is Roger’s birthday and we’re gonna sing him Happy Birthday.” She then floated on her back and led the crew in song! Diana Nyad swam 80.38 miles by 9:30pm on Sunday night. That distance is farther than anyone else who has attempted to swim from Cuba to Florida. 38 Hours into the swim, at 11:00 PM on Sunday night, winds picked up to 23 knots and the kayakers floating next to Nyad had to be pulled out of the water for safety. Early this morning, around 7:00am Eastern Time, cruise ships made way for Diana Nyad as she approached to coast of Florida. Shortly after, around 7:15 AM, doctors reported Diana had gotten very cold, so she did not stop for feedings over night. Diana Nyad has finished the 110 mile swim successfully in just under 53 hours and was able to walk up the beach without assistance. Her official time: 52 hours, 54 minutes 18.6 seconds.